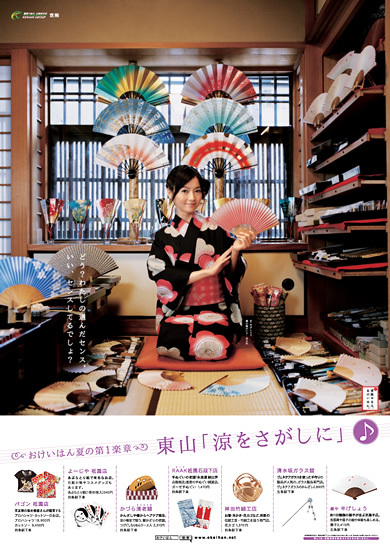 In 2000, the Keihan train line launched an advertising campaign called おかいはん (okeihan) to promote themselves using young, fashionable spokeswomen photographed around the Osaka-Kyoto area, seeing the sights and culture available in towns and cities along the train line. This campaign was still running when I lived in Osaka, and the current Okeihan girl was Keiko Morishoji (the idea being that she lived near Morishoji Station! ), the third-generation Okeihan character, who started in 2006. Keiko (played by actress Jinno Sachi) was born into a musical family and was a Conservatory of Music student at the "Duck River Academy of Music." She was the face of the campaign until 2009, and I thought she was the cutest thing on this earth. Her clothes were bright, stylish and just the sort of things I liked to wear, and she was always doing something that looked interesting to me. I started to take photos of her ads when I saw them, and downloaded a bunch of Okeihan desktop wallpapers. Emily often teased me about my enthusiasm for Keiko, whom I called "Keihan-chan," not knowing her name at the time. We travelled on that line pretty much daily, and often together, so whenever a new poster came out (and that was fairly frequently!) I was all over it. I professed my love for Keihan-chan every time I guided someone new through the Keihan train system. And then...then, they retired my Keihan-chan and replaced her with a new girl, Keiko Kuzuha! Kuzuha was cute enough, but I never expected Keihan-chan to vanish so suddenly, so I was quite disappointed. At the time, I didn't realize that there were two other Okeihan spokesgirls prior to my arrival in Japan - Keiko Yodoya and Keiko Kyobashi. Well. As it turns out, the Keihan line is launching their newest girl to stardom very shortly - voting starts this Monday, October 15th, for the brand-new Okeihan campaign. Well! 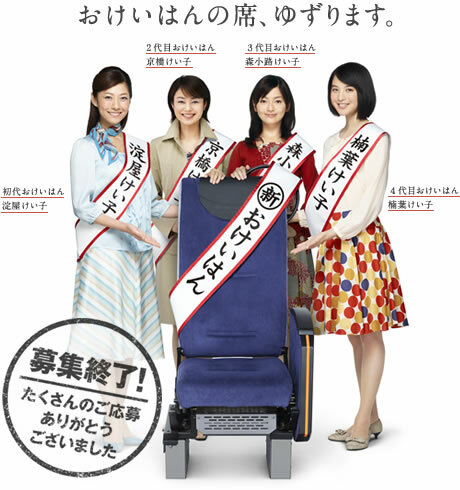 I guess it's my civic duty, then, if we MUST have a new Keihan-chan, to make sure the proper one gets picked! Be sure to pop by Keihan's website tomorrow and cast a vote!